Battle for Judea & Samaria MDA funding continues led by MK Bezalel Smotrich; MK Gafni closes meeting after his proposal was voted down. 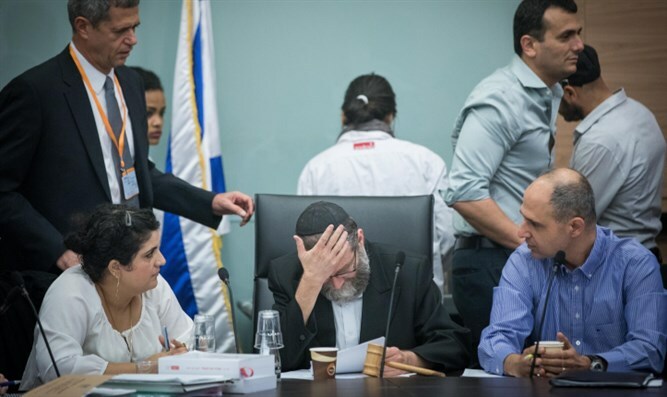 Finance Committee deliberations reached an impasse Monday afternoon after committee Chairman MK Moshe Gafni (United Torah Judaism) failed to muster a majority to approve regulations and budgetary transfers on the committee’s daily agenda. Gafni has refused to approve the transfer of NIS 5.5 million ($1.6 million) earmarked for MDA operations in Judea and Samaria. Gafni has held up the budget transfer due to a dispute with former Health Minister Rabbi Yaakov Litzman regarding the budget of haredi rescue organization United Hatzalah, which operates alongside the MDA. Gafni has claimed the money is being delayed due until the government agrees to transfer NIS 500,000 ($145,000) to United Hatzalah. Due to the failure to transfer the budget, the MDA Director General announced that he was forced to cut MDA operations in Judea and Samaria in the absence of a budget to finance it. Last week, MK Bezalel Smotrich (Jewish Home) asked MDAs Director General to resume regular operations in Judea and Samaria. Smotrich pledged to use his position on the Knesset Finance Committee to ensure that the promised government funds will be transferred to MDA within three weeks. MDA’s Director General agreed to Smotrich's request and ordered MDA to resume regular activity in Judea and Samaria. MK Smotrich later notified coalition chairman MK David Amsalem that if the government does not force MK Gafni to act in accordance with coalition regulations and pass the budget that has been on his desk for over a year, he will be forced to filibuster the Finance Committee. Indeed, MKs from both the coalition and opposition who understood the situation's severity arrived to the meeting and announced that they would not allow any committee vote until the MDA budget was transferred. An income tax-related measure put up for a vote in the committee Monday by MK Gafni failed to pass due to sweeping opposition from the Right and Left, due in large part to the MDA budget spat. After realizing that he lacked a majority to pass any vote, MK Gafni adjourned the meeting. "This is a matter of life-and-death,” said Smotrich. “Funding for MDA’s Judea and Samaria operations are sitting on committee chairman Gafni's desk for over a year. Internal party politics can't be a pretext for playing with human lives. Knesset Members from the Labor party, Kulanu, the Likud, and Jewish Home understand the importance of the matter and have drawn a clear red line to Gafni's irresponsible conduct vis-à-vis Magen David Adom. The ball is in the hands of MK Gafni and I am sure that common sense will prevail, MDAs money will be released, and it will thus be possible to renew the committee's routine activity."